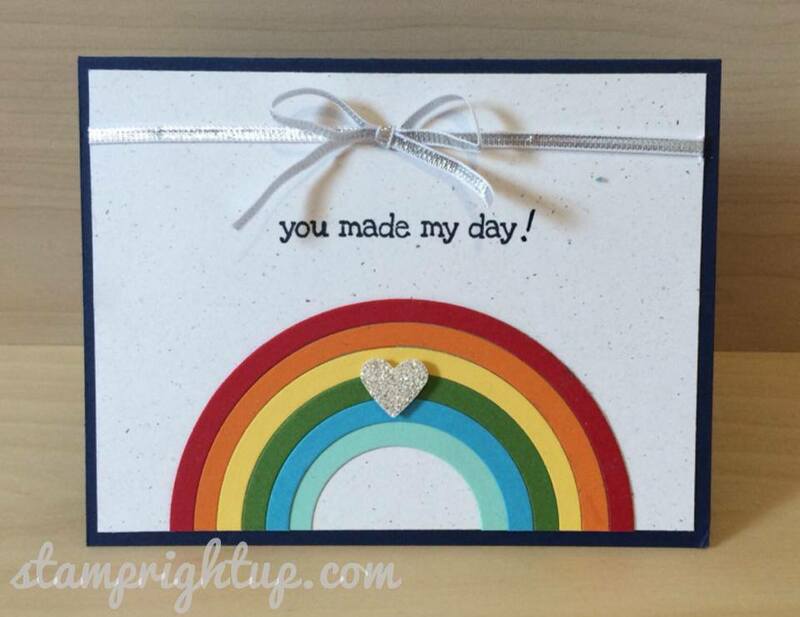 rubber stamp | Stamp Right Up! Thanks to Mary from Waynesboro Pennsylvania, I got to spend hours in my craft room doing what I love, and getting paid to do it!! Seriously, can you think of a better scenario?! 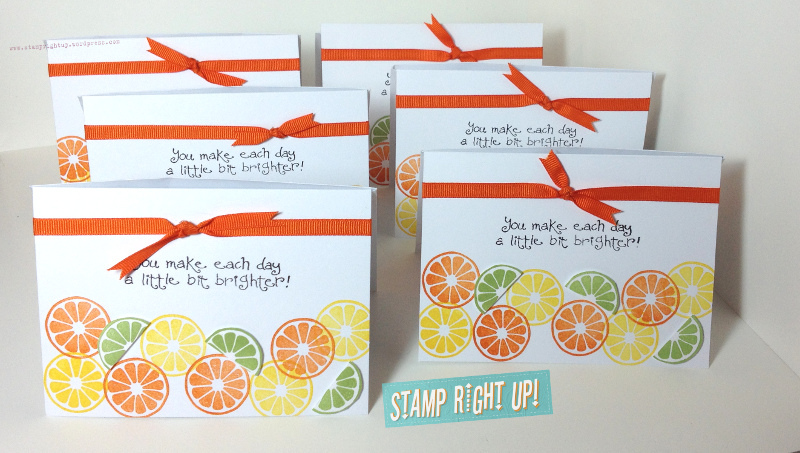 Mary purchased a set of 10 “You Brighten My Day” cards from my Etsy store Sunday night. This was my first custom request and I was thrilled to bits! It sure was a learning curve!! 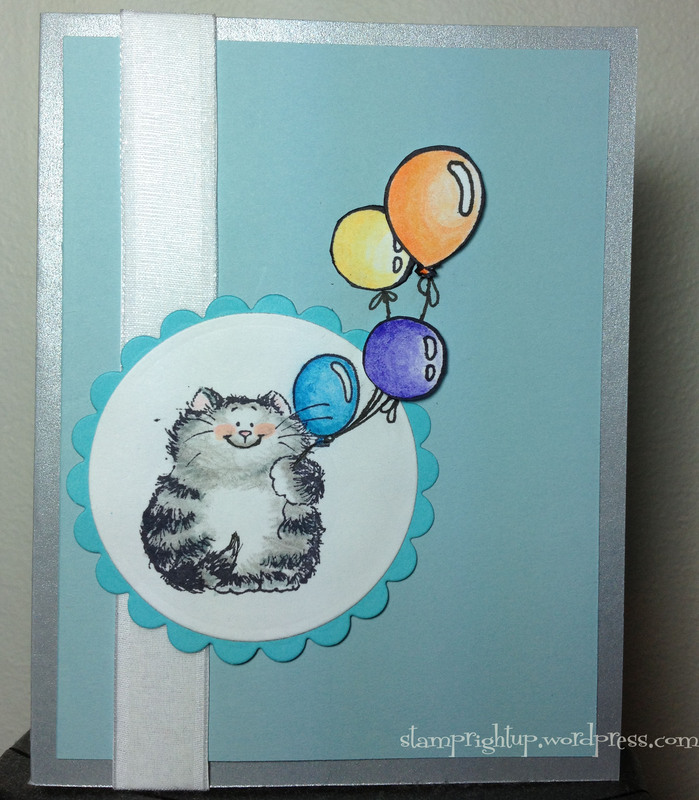 I thought it would be easy peasy to recreate a card… was I mistaken!! Thank GOODNESS for my uber talented loving boyfriend who is a trained artist AND graphic designer AND marketing guru… He helped me devise a formula to create a ‘template’ to ensure that all my cards were fairly consistent. We sketched out a rough template onto a blank card then went over it with a sharpie. He gave me his light box which I used to place the template underneath the blank card and that gave me visual guidelines to know where to stamp each fruit, and where to place the sentiment. I created a custom tag (which I will be posting in a day or two) and tied the lot together with orange bakers twine. The package was as cute as the cards!!! I even stamped a lemon lime and orange onto the front of the parcel by her address. Hopefully she is as happy with her purchase as I am for making it! So I have been on a crazy coloring binge since I have discovered the blending technique using colored pencils & baby oil from my post here. I fell in love with the critter stamps from Penny Black – the hedgehog, kitties, mice and critters are just about the cutest things EVER and are versatile enough to use for any age & occasion card! I have found that Simon Says Stamp is the best place to get them online (other than Ebay) – great prices and even BETTER shipping! Being Canadian I really appreciate when sellers can offer reasonable rates. Ok – enough of the hype, here is my latest creation. I used only colored pencils & baby oil to color it. I love that it looks like a cross between watercolor pencils & Copic (or alcohol markers). Best of both worlds I think! My boyfriend (yep, he’s *that* awesome) came up with the idea to fussy cut the balloons them pop them up with pop dots. The inside has a white matte to cover the ribbon, and I used the “Celebrate” sling mount from the Outlined Occasions set from Stampin Up’s 2011 Sale-A-Bration. Coloring. Not just for kids anymore! 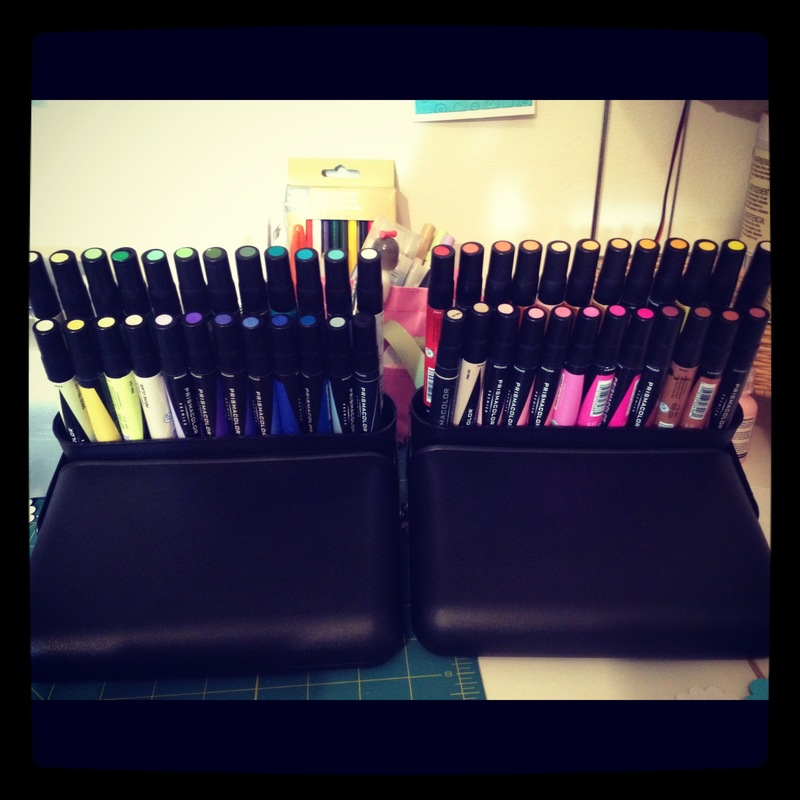 I just recently acquired a set of 48 Prismacolor markers. These are very similar to Copic markers – they are alcohol based ink which allows for blending and non-streaking when filling in. 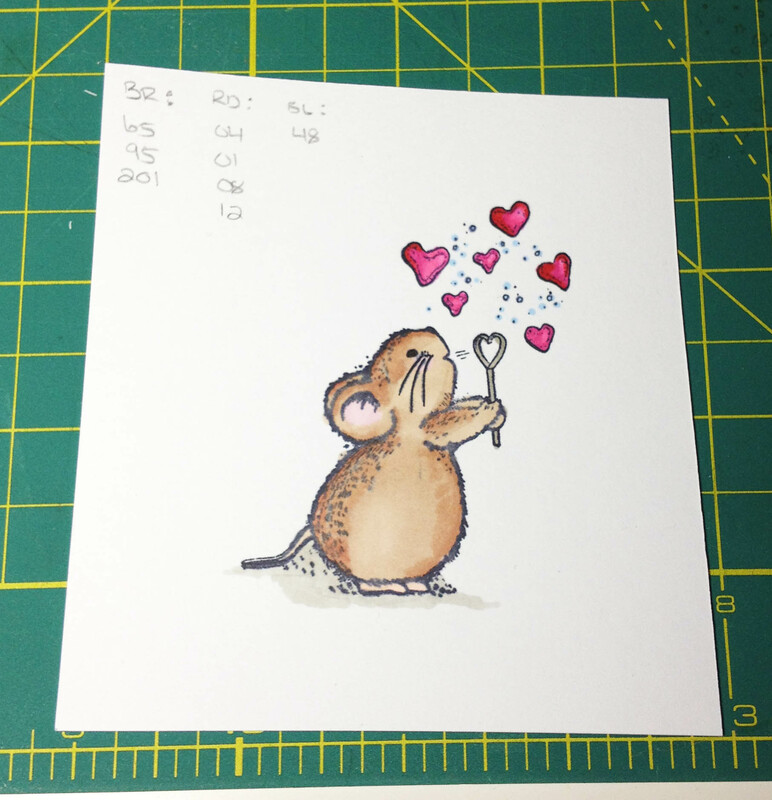 Thanks to the brilliant Darlene Devires and her tutorial post showing step-by-step instructions on how to color with copics markers (or Prismacolor in my case) I was able to color this Mouse stamp that I had got to make boyfriend a Valentine’s Day card with. Those penciled notes you see in the top left corner are my notes with each of the colors I used to create this image so I know for next time what the best colors are to use. Did you know that Stampin Up! has been around for over 25 years?! I did not even know about it until November 2012 when I met a demo at a craft fair who was selling their finished works. She gave me a catalogue and I was hooked!! I poured over the book for DAYS. Literally! It was like I was a kid again combing through the Consumers Distributing book for Christmas toys! When I spoke to the demo on the phone, she told me about being a ‘demontrator’. I didn’t realize it’s not as easy as it sounds. First: Do you want to be a demonstrator? Do I have at least three people who I know I could rally up once a month to do a ‘make & take’ demo class with? Would these people be willing to spend $25 per person to participate? When I first signed up I did NOT know at least 3 people, but I thought I would save tons of money so I signed up as a demonstrator anyway. 1. Buying items that you know you could mass produce some cards & sell the finished cards to stores, cafes, friends etc. 3. Sign up when there is an incentive promotion for new recruits. I signed up when there was a free set of ink pads (the whole set!). Then place a one time order and stock up, and if you can place another order then yay, but if not, at least you have some goodies added to your crafting creation tool repertoire! Ask your potential upline HOW they will support you. * Monthly meetings to check in on progress. There is SO MUCH I didn’t know when I signed up, that I wish I did. Hopefully this has helped you, and maybe clarified some questions for you. Feel free to contact me anytime if you too have been ‘orphaned’ by your upline, no matter WHERE you are, I will do whatever I can to help you out.